Long-term trials at Rothamsted Research have confirmed how the devastating take-all root fungus of cereal crops can be contained by careful choice of the varieties grown. Substantial reductions in a deadly root disease of wheat crops and corresponding increases in yields of grain and straw mark a significant advance in the continuing war to protect the staple cereal from the ravages of the take-all soil pathogen, to which it is highly susceptible. Researchers have now shown that careful selection of the variety of the first wheat in a new cropping cycle can reduce the disease’s severity and increase yields in the second crop variety. Their findings are published today in Scientific Reports. Furthermore, these benefits are irrespective of the second variety or its susceptibility to this fungal pathogen. And though the findings relate to short rotations, in which the type of crop is changed after just two harvests, the benefits seem to continue for subsequent harvests. 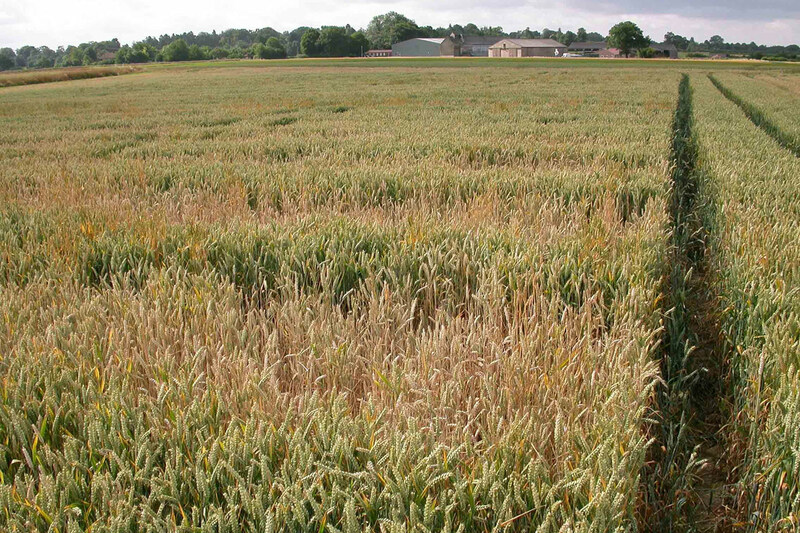 “In rotation field experiments, we demonstrated the considerable and lasting impact of the choice of the first wheat variety on root health and the yields of the second wheat,” says Vanessa McMillan, a plant pathologist at Rothamsted Research who led the study. The research team had already identified and reported a new genetic trait in wheat, called take-all inoculum build-up (TAB); in spite of wheat’s high susceptibility to take-all disease, there are low TAB varieties that minimise the presence of the pathogen in soil. The team’s latest findings show that using one of these low TAB varieties in Year-1 of a cycle generates the benefits for the second crop. The team is now investigating how lasting are these benefits in subsequent crops. Take-all, caused by the soil-borne fungus Gaeumannomyces tritici, is the major root disease of wheat worldwide. Infection causes yellowing of crops and stunted growth, typically developing as patches that can spread throughout fields. Few chemical seed treatments are available. Genetic traits, such as TAB, could provide a new way of combating take-all, particularly in association with cultural control techniques, such as crop rotation, within an integrated disease management strategy. As part of the latest work, the team sampled commercial wheat varieties across a range of field sites from the AHDB Recommended List that demonstrated variation in TAB properties of modern wheats currently being grown by farmers in the UK. “While there was evidence of significant interaction between the varieties across the trial sites, we could still identify a small number of low TAB varieties across all sites,” notes McMillan, who also leads the take-all research group at Rothamsted. Her group is currently investigating the potential mechanisms underlying the low TAB trait, including exploring whether low TAB varieties create an antagonistic rhizosphere environment against the take-all fungus. Rothamsted’s take-all research group is part of one of the institute’s five strategic programmes, namely Designing Future Wheat, a multi-institute initiative that focuses specifically on improving overall crop val-ue and resilience. The work is funded by the Biotechnology and Biological Sciences Research Council (BBSRC) and the Lawes Agricultural Trust (LAT). The rotation field experiments formed part of the core project of the Wheat Genetic Improvement Network (WGIN), which is supported by the Department for Environment, Food and Rural Affairs (Defra). Through independent science and innovation, we make significant contributions to improving agri-food systems in the UK and internationally. In terms of the institute’s economic contribution, the cumulative impact of our work in the UK was calculated to exceed £3000 million a year in 20151. Our strength lies in our systems approach, which combines science and strategic research, interdisciplinary teams and partnerships. The Lawes Agricultural Trust, established in 1889 by Sir John Bennet Lawes, supports Rothamsted Research’s national and international agricultural science through the provision of land, facilities and funding. LAT, a charitable trust, owns the estates at Harpenden and Broom's Barn, including many of the buildings used by Rothamsted Research. LAT provides an annual research grant to the Director, accommodation for nearly 200 people, and support for fellowships for young scientists from developing countries. LAT also makes capital grants to help modernise facilities at Rothamsted, or invests in new buildings.